This antenna works great! In my earlier post I mentioned that SWR was high on 30m, but last night I let the automatic tuner on the TS-440S match it — and ES3AX gave me a 579 from Estonia! 4Z5MU (Israel) went into the logbook last night, too, but that was on 20m. Building the antenna has taken a bit. It has been fun for the most part. We finally have it almost finished. The past couple days have been really busy. I hope that I can remember them so that I may provide my readers with an understanding of what we did. It was pretty chilly on Monday. The wind was blowing pretty hard so we did not get to go on the roof. We spent the day getting the antenna wire cut and put onto the balun. Once we were done with putting the antenna wire on the balun my dad had to put it on to the pulley attached to the aluminum pole. My dad and I put the pole against the house and took the two ends of the antenna wire and tied ropes to them. After that we took the ropes and tied them to some trees. It was so windy that it was hard to hold the pole. While I was holding the pole my dad took the SWR meter and tried to figure out if he needed to add or take away some wire from the connectors on the balun. It did not work so well. [Being so close to the ground, SWR was sky-high on 40m.] We took the pole and the ropes down and called it a day. On Tuesday we first shot a weight over the house so that we could get a safety line over the house. 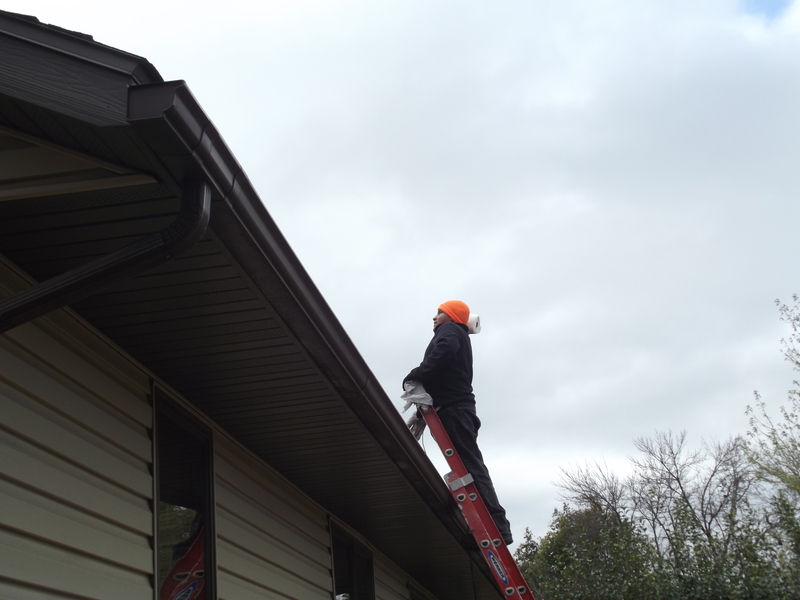 The safety line was for when Dad went on the roof. It took us quite a few tries to get it over the house. Once the line was over we attempted to put a line over the tree which is where one end of the antenna wire is going to sit. Using my slingshot did not work. My dad went up to Runnings to get ground wire and PVC pipe to build a potato launcher. It took him a little while to find all of it. When he came home we assembled the potato launcher. After supper we tried to get a line over the tree, but it was dark and windy. We did launch a potato with a screw in it. It did not go over the tree because of the wind. It went over a couple trees. We could not find the potato. Wednesday we did manage to find the potato. We had to cut some of the line we used. 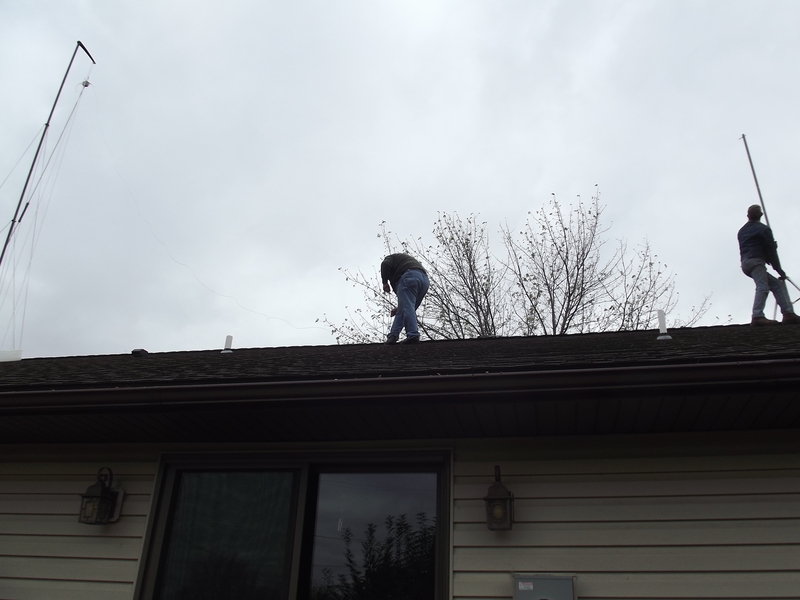 My dad decided he would get the line into the tree when he was on the roof. A friend of my dad came over and helped put the aluminum pole with the antenna attached and the other pole into the tripods. The antenna is finally up! My dad just has a few final touches to do and then it will be up there for good I hope. Last night my dad was able to talk to some people on the air using the antenna that is now on the roof. Dale and I stringing the long leg of the New Carolina Windom. Well, it’s almost done! The antenna is in place, optimized, and operational. Last night my son helped me finalize the connections at the ground rod and string the coax and ground wire into the house. There are only a couple of details to take care of before winter sets in, but they shouldn’t take much time — I hope to be done with them by next Monday’s end if not sooner. I hope to find time soon to write up some of the lessons I learned. I couldn’t have done it without the help of my son Antonio and my friend Dale (“half squirrel, half monkey”), not to mention the encouragement my wife kept giving me. My son was my constant companion, “go-fer,” and an indispensible helper on many tasks. And Dale might have saved my life since I’ve no business being on the roof with a bum leg. He did the lion’s share of the work up there the day we put up the masts and the antenna. He’s so good on a roof I think he could have run laps around the perimeter, while I clung for dear life to a safety line when getting on and off the ladder. SWR is below 2:1 across all of 40m, 20m, 17m and 10m (except for the first 100 KHz of 10m, but even there it’s still below 3:1). It’s high on 30m, 15m, and 12m, but I’ve read that this can be improved by running radials from the bottom of the RF choke. I’ll let you know how that works. Last night I made one contact after tidying up the connections in the shack: TX7M, a DXpedition in the Marquesas Islands, French Polynesia. That was a first for me, working a DXpedition. It was decidedly unsatisfying — the ultimate antithesis of a ragchew with a worthless signal report (just a recorded “599” that goes to everybody, regardless of their true readability, strength, and tone). But it was still encouraging, especially since it was on 17m, a band I’ve never even touched before I built this antenna. I’d enjoy hearing from any of you who end up using this spreadsheet to build an antenna! If you find any bugs in this spreadsheet, please let me know. Note that it is protected for your convenience, but you can unprotect it anytime you like to see the formulas in each cell (there is no password). 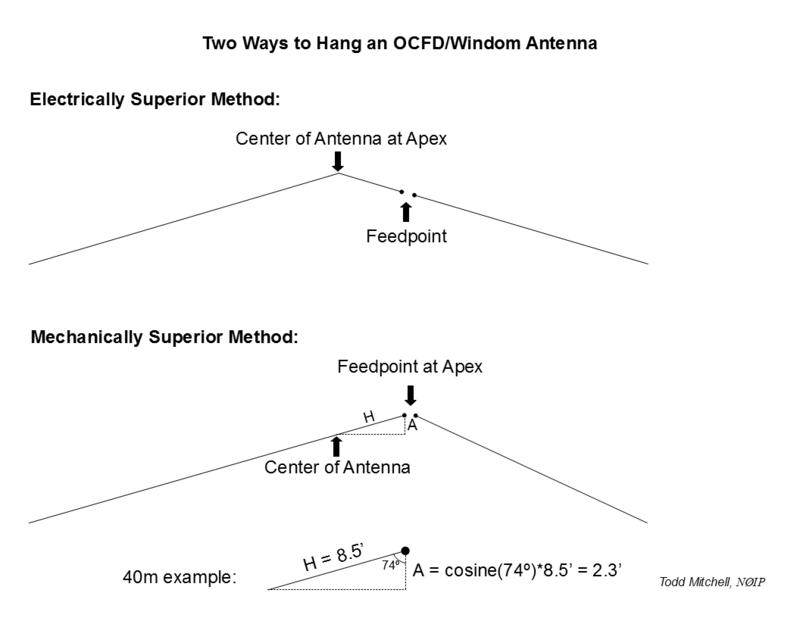 What’s the Best Way to Hang an Inverted-V OCFD/Windom Antenna? What is the best way to hang an off-center-fed dipole or windom antenna as an inverted-V? Should you hang the feedpoint at the apex, or hang the center of the antenna at the apex? From an electrical standpoint the best way is to hang the center at the apex. That is where the current is at a maximum on the lowest resonant frequency. But that leaves all the weight of your balun, coax, and (in the case of a New Carolina Windom) RF choke unsupported by anything but the antenna-wire itself. So from a mechanical standpoint the best way is to hang the feedpoint at the apex, with all that weight hanging straight down from the hanger. Either way it’s a trade-off. I think it makes sense to hang the feedpoint at the apex if the angle of your V is reasonably broad. The mechanical benefit outweighs the electrical cost in this case. As you can see in this diagram, you really don’t give up much height at the center of the antenna. My own 40m New Carolina Windom, with the longest leg at 74o from vertical, sacrifices only 2.3′ at the center of the antenna. Even if it were cut for 80m the sacrifice would only be 4.5′. A 160m version (I know of one fellow who plans to build one!) would give up almost 9 feet, though. You might want to hang the center at the apex in that case, unless it’s already so high that 9 feet doesn’t matter much. You can always figure out a way to support the feedpoint in some way if you need to. This changes if you mount your V with a narrow angle. Dropping the longest leg to 45o from vertical would cost me 6′ on my 40m New Carolina Windom! In that case it would probably make more sense to hang the center at the apex. Oscar And Ole Have Huge Appetites! There you go! 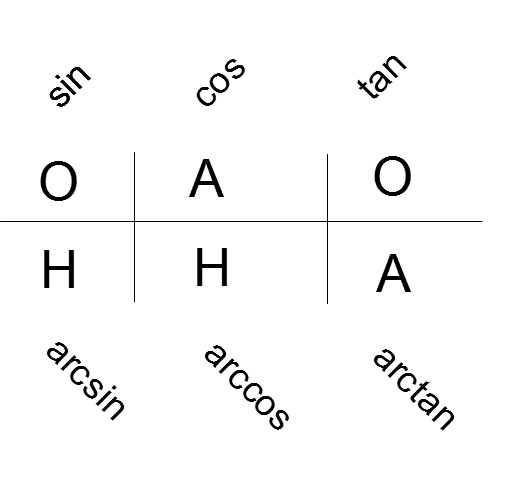 Of course, you’ll have to know the angle to figure this out. To see an example of that calculation, check out my previous post. This is a spring that I bought at the local hardware store. I didn’t do any calculations to select the thing. I just went through the drawers and handled all the likely-looking springs they had. This one felt about right when I pulled on it. I tied it into the 3/32″ braided dacron/nylon rope with a loop long enough to match the length of the spring when fully extended. The electrical tape is to prevent chafing for as long as it stays on. The spring is strong enough that on a calm day it doesn’t stretch at all, but it still has plenty of give if the wire gets to whipping around. Will it help this antenna-system weather the storms we get out here in western Minnesota? Time will tell! For a great tutorial on waterproofing coaxial connectors, check out this post by Paul, AE5JU, over at K9ZW’s blog. I didn’t use Scotch 130C Coax Seal like he does since by the time I discovered its existence I was out of time to acquire it for this project. Next time! The New Carolina Windom uses part of the feedline as a vertical radiator — the voltage balun used to feed the off-center fed dipole allows common mode current to travel down the feedline. How do you determine how much of the feedline radiates? From what I’ve read, you do this by placing an RF choke (sometimes called a “line isolator”) at some point in the feedline to clamp off the common mode current. For an 80 meter version, you put the RF choke 20 feet below the feedpoint. For a 40 meter version (like I’m building), you put it 10 feet below the feedpoint. A note about the choke [between the balun and the feedline]: The choke [line-isolator] is simply a straight piece of coax with ferrite cores strung on it. Just use the same coax that you are using for the field line from the Xceiver to the choke. I have made a mod to the choke also. Instead of bending it back inside of the CPVC tube, make it a straight piece of coax about 0.3 meter. The length is not critical but should be no shorter than about 12 inches. Use as many ferrite tubes that will fit in-line on that length. 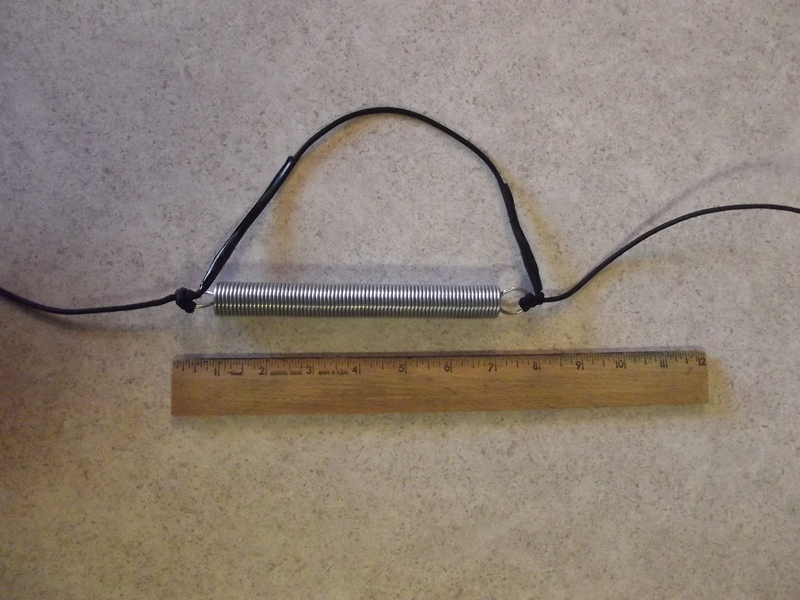 I built my RF choke using 12 FB-56 ferrite beads (mix 43) from Palomar Engineers strung on a piece of RG-58 coax and secured on each end with wire-ties. While Mr. Carlson chose CPVC for a lighter enclosure, I used PVC. In order for the SO-239 bulkhead-mount coax connectors to fit in the endcaps, I had to go with 1 1/4″ pipe. This did make for a pretty large enclosure — the beaded coax in the pipe does slop around a bit in there when shaken. If I have to do this all over again I’ll figure out some way to secure the innards of this thing (maybe by injecting some expanding foam?). As it was I inserted a few inches of double-sticky foam mounting tape inside the last end to be sealed, which did help somewhat. I attached one end of the beaded coax directly to an SO-239 connector/end cap, but the other end required several inches of slack to stuff into the tube when it came time to push the final end-cap onto the pipe. Here is a slideshow of my RF choke. After I took these photos I covered the coax connectors with cling-wrap and spray-painted the whole thing forest green.